There followed a few weeks of waiting and gathering up a few tools I didn’t have and was going to need (yes, I need a #7. For a given value of need. Oh come on, look at all that lovely cast iron…). 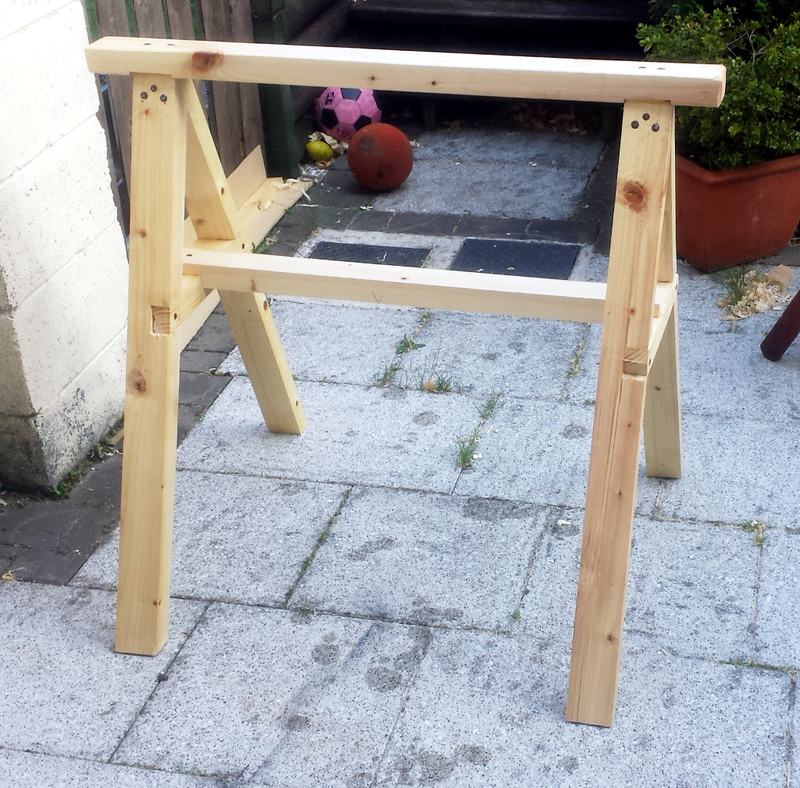 Then after that, once the moisture content was more or less stable in the wood, I hauled out the 2×3 lengths I had and knocked up some quick sawhorses because I was not about to plane an entire workbench on a workmate that did more dancing than I did at my wedding. 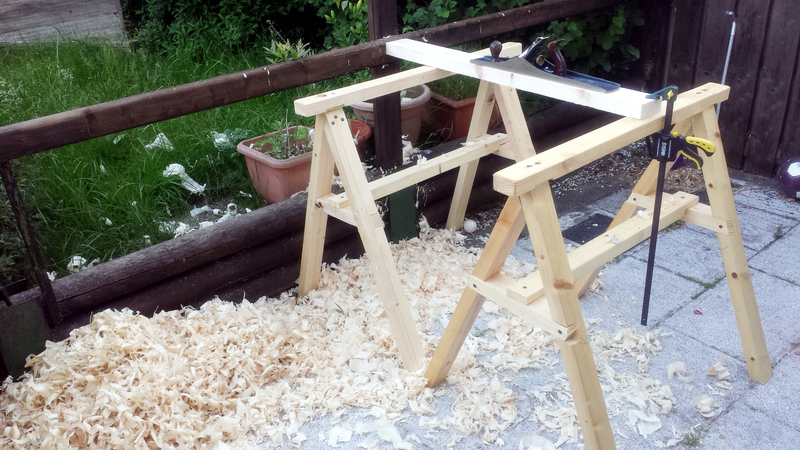 Nothing fancy, but so much damn nicer than planing on the workmate. Next up, planing the glue faces of the leg pieces. I’d taken a week’s holidays (mainly because work had been a bit insane for the previous few months and I needed either downtime or valium and the holiday was cheaper), and the idea was to do all this during that week. I spent most of the first day grinding and sharpening a few dozen plane blades and chisel blades and other prep stuff and the legs were day two. 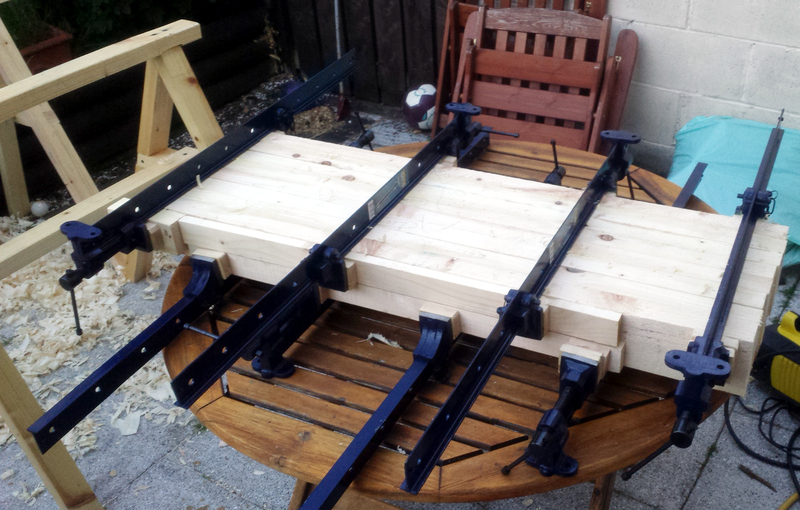 Glue-up was done for all four legs at once (I do love those cast iron clamps). 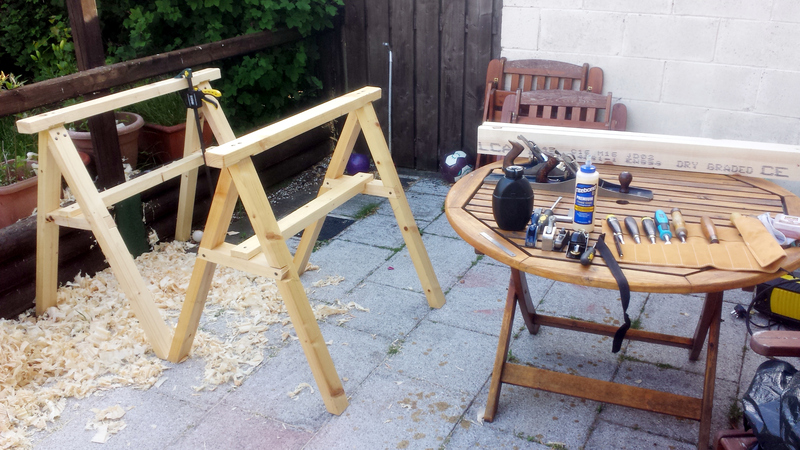 The next morning, I undid the clamps, everything looked grand, I cleaned up the outside faces with the #4½ but didn’t bother making them square yet, and put them back in the shed, planning to start on the top after lunch. And then the heavens opened and the rest of the day was spent watching rain from indoors. And then it rained all the next day. And the next. And for the rest of the week. By Sunday I was about ready to spit. An entire week with nothing done. Fudge.